The check in and check out procedure went smooth. No complaints. We stayed in 502c and it was a beautifully designed condo. It felt like a home away from home. 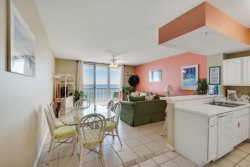 The condo was very clean, great matching decor with a beach theme, granite countertops in the kitchen with stainless steel appliances, oceanfront, up to date televisions in all the rooms, nice laundry room (love the decor on the hot water heater), pretty ceiling fans, etc. Our family was very impressed and felt very comfortable with our stay. We would defintely stay again and preferably in this unit. We felt confident that our reservation was being handled efficiently. Enjoyed the emails that arrived prior to our visit with helpful suggestions. One maintenance issue was handled promptly. All encounters with team members were very professional. We absolutely loved Sunset Harbor Palms! It is well-maintained and the amenities are excellent. We especially enjoyed the lighted fishing pier and the gazebo. Plus, you have your own little private beach! We plan to return and can't imagine that any other community can compare. We actually like that it's on the sound side of the island rather than the gulf side. Very peaceful. The front staff was very friendly. What an awesome place to stay. Had all the beachy things without the crowd! The condo was nicely decorated. Loved the king size bed in the master bedroom. We tried the local restaurants - favorite was the Shrimp Basket! Enjoyed sitting on the balcony watching the dolphins, storks, seagulls, and pelicans, and amazing sunrises and sunsets! The team that I talked to from the very beginning when booking our vacation was very friendly and helpful as well as the team who checked us in. Over all we had a great vacation. The staff was awesome! They were very helpful and accommodating. I called them a couple of times for information at fishing trips, great seafood places, and just general information. They were great....very helpful....and exceptionally pleasant. The STAFF was awesome! They were very helpful and accommodating. I called them a couple of times for information at fishing trips, great seafood places, and just general information. They were great....very helpful....and exceptionally pleasant. The CONDO was perfect......exceptionally clean, all the amenities of home. The beds were very comfortable and the linens were great. The bathrooms were very clean, which for me is a must. I am quite OCD about cleanliness....my husband was impressed that I didn't feel the need to re-clean after our arrival. We have always stayed in Panama City Beach in years past. But after staying at the Summerwind we have found us a new "home" for vacationing. We love the area....not as touristy and crowded as other areas. Very quiet beach. If we want to be in the "thick" of the activities Destin and Pensacola are within 25 minutes of us. Close enough to enjoy the entertainment, Harborwalk in Destin, and the nightlife in Pensacola. The FOOD in Navarre is amazing. One of our favorites is East Bay Oyster House. Absolutely the BEST. Actually, the guest services team recommended it. And I'm so glad they did. The Lagerhead next door to the Summerwind was also very nice for a casual meal, live music, night movie outside, and great atmosphere. I can't say enough about our trip to Navarre. We hadn't had a vacation in 8 years and Navarre put the shine on for us. We have already got our trip in the works to return next year. Had an excellent experience as a first time guest and will most assuredly return! Front desk team was amazing - as well, as after-hours maintenance! Check-in went so easily; staff was welcoming, friendly, and VERY helpful!!! LOVED our stay. Loved all the kitchen items - blender, coffee pot, all the utensils and dishes!! VERY quiet condo. We loved sitting on the balcony - even w/beach bulldozers!!! We didn't get to meet the team until the morning after check-in because of how late we arrived, but interfacing via telephone and email prior to arrival was excellent! The ease of the after hours check in process was greatly appreciated, and the team member made finalizing check in the following morning a breeze! Other than my not realizing that the property was a second floor unit, it was perfect! Location was great, and it was really nice to have our own space while visiting family in Navarre. Plus, the family we visited loved visiting us thanks to the pool! The bed was more comfortable than I anticipated, and there was more space than expected for a 1 bedroom unit.